1. THE INVENTION OF THE WIRELESS TELEGRAPH: Guglielmo (Bill) Marconi has ideas for an invention that will (a) replace the wired telegraph and transatlantic cable, (b) help ensure the safety of ships at sea. Marconi sends, in 1901, his famous S (dit dit dit) in Morse code from England to Canada. 2. FROM WIRELESS TELEGRAPH TO WIRELESS TELEPHONE: Inventors like Lee de Forest and Reginald Fessenden want to find a wireless substitute for the wired telephone. The human voice could add a nuance to communication not possible with the telegraph, but people like Marconi decry it, saying it will not be private and others will be able to hear it. 3. THE FIRST BROADCAST: In 1906 at Brant Rock MA, Fessenden plays his violin, sings a song, reads a bible verse or two into a wireless telephone of his own invention. This is the first broadcast and it happens Christmas Eve, 1906. It is a broadcast because it is designed for more than one listener (not 2-way) it is pre-announced. His goal is to find financial backers. 4. LEE DE FOREST: Probably the most important person in the development of radio, de Forest does two important demonstrations of wireless telephone; (1) in 1907 he equips the Navy fleet with his wireless telephone, an arc transmitter, and plays phonograph records to shore stations as the fleet comes into ports like San Francisco, and (2) in NYC he broadcasts on several occasions well-known opera singers to an audience of reporters. He wants to bring culture into homes. 5. 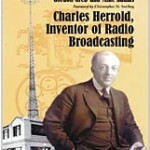 CHARLES HERROLD: In San Jose, Herrold in April 1910 is quoted in a notarized affidavit published in a national magazine, “we have given wireless phonograph concerts to amateur men in Santa Clara Valley,” one of the very first published references to what we now know as the activities of radio broadcasting to an audience of more than one. He operates a wireless training school, The Herrold College of Wireless and Engineering, in a building at the corner of First and San Fernando in San Jose. 1. 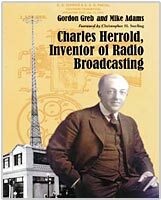 CHARLES HERROLD: Between 1912 and 1917 Herrold and his students are broadcasting music and talk on a regular schedule to a growing San Jose audience. College radio. 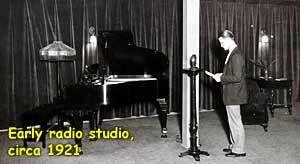 He also broadcasts every day to receiving stations at the Pan Pacific International Exhibition in 1915. 2. WORLD WAR ONE: April, 1917. All amateur wireless stations are ordered shut down, silent, so that the Government can use radio for defense purposes. The war is important to radio technically as the vacuum tube, invented earlier by de Forest is improved for war communication, and all other radio patents are pooled for defense reasons. 3. LEE DE FOREST: After the wartime ban on wireless ends in 1918 he sets up a station in High Bridge NY, and broadcasts music, news, election returns, etc to NYC, this time using his vacuum tube as a transmitter. The Federal Radio Inspector shuts him down saying “there is no place on the ether for entertainment.” Most still believed that radio should be for two-way communication, and there was general agreement that the Navy would be in charge of all radio. 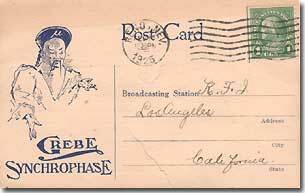 De Forest comes to San Francisco and sets up another station in 1919 and broadcasts daily. 4. FRANK CONRAD: Meanwhile, in Pittsburgh, PA a Westinghouse Corporation engineer named Frank Conrad had been allowed by the government to be on the air during the war to develop the de Forest vacuum tube into a transmitter for the war effort. He uses a phonograph to test the audio; he gets calls from a few experimenters who are, in defiance of government order, illegally listening to his tests. He plays records to this clandestine audience every Saturday Night. 1. 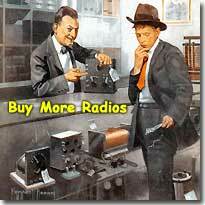 LICENSED RADIO BROADCASTING: Conrad’s company, Westinghouse, asks him to go on the air on a regular basis to send out music and they’ll sell radios to pay for the service. They apply for a commercial radio license and in November, 1920, KDKA goes on the air to broadcast the election returns of the Harding-Cox presidential contest. 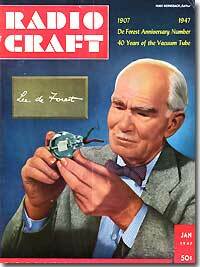 Westinghouse takes out ads in the newspaper advertising radios for sale to the home consumer. This station receives the first official government license. The dark years of war give way to peace and prosperity. 3. TECHNOLOGY: The decade begins with people listening to home made crystal sets with headphones, progresses to large battery-operated sets with dozens of dials and a horn speaker to electric console radios designed as fine furniture, single knob tuning and loudspeakers. 4. ADVERTISING: By 1923, WEAF in New York accepts the first “radio ad.” Because this station is owned by AT&T, it is the only station allowed to engage in “toll broadcasting” under the RCA agreements. Other stations are already advertising because no one can stop them. 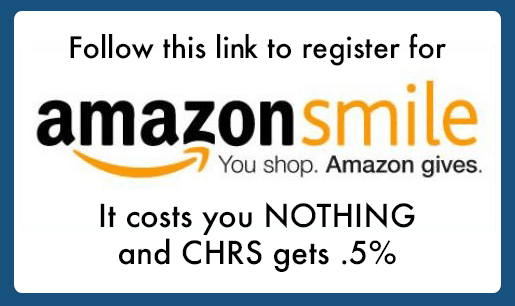 Many stations are owned by businesses and their only reason for broadcasting is to sell something. 5. NETWORKS: Having broken the AT&T monopoly on “chain broadcasting” NBC and CBS are formed as the first radio networks by the late 1920s. 6. REGULATION: The radio dial is filled with hundreds of poorly regulated transmitters, many interfering with each other to the point where no one can get clear reception. The Federal Radio Commission is formed and the Radio Act of 1927 is passed which re-assigns stations to clearer frequencies, and for the first time makes radio stations operate in the public interest, convenience and necessity. The decade ends with radio as a fully formed industry. Amos and Andy is #1. The roaring 20s will give way to the great depression. A major social change is on the way. 7. 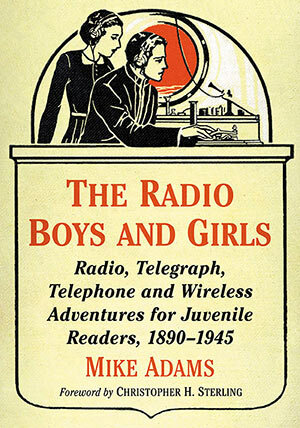 PRODUCT PLACEMENT: Mike Adams writes a book called the Radio Boys and Girls, all about early wireless & radio. McFarland Publishing, 2015. 1. RADIO AS A BIG BUSINESS: The depression and people begin to listen to and depend on radio to uplift them during a major economic crisis. President Roosevelt is the first “radio president” and his “fireside chats” help to give confidence to Americans during their darkest hour. 3. THE DECADE OF THE SPONSOR: Advertisers, through their agencies, own and control entire programs, hire and fire talent. Shows are named for the sponsor. Scary. 4. 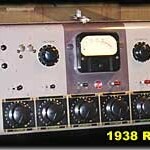 THE FCC IS FORMED: In 1934, it replaces the FRC and regulates radio. Their mandate is very similar to the old FRC. At the start of the decade they try to clean up the content of broadcast ads and claims, even take a few self-described “radio doctors” off the air. By the end of the decade they will complain that radio is not local enough, that the un-licensed national networks control the programming but the stations are licensed to serve local communities. 5. PRESS-RADIO WARS: Newspapers fear that the immediacy of radio news will drive them out of business. They refuse to let radio stations read from their pages until after the papers hit the streets. Eventually AP and UP are formed, and CBS radio forms a news departments. 6. RADIO-MUSICIAN WARS: The musicians union, trying for even more power refuses to let their musicians perform on radio until new agreements are worked out. Some stations play records of foreign artists not covered by the AF of M.
7. EDWIN ARMSTRONG INVENTS FM: Only the engineers care that there is a new delivery service that eliminates the static and noise and the bad audio AM. Station owners are making a fortune and they don’t want to make existing receivers obsolete. FM will sleep until the 1970s. 8. WAR IN EUROPE: Walter Cronkite, Edward R. Murrow, and others build their reputations as the first radio journalists. By the end of the decade radio is an important source for news. 1. 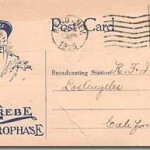 WWII: Radio is the voice of the war effort. Entertainers soothe a confused public, news reports inform. Radio unites. 2. 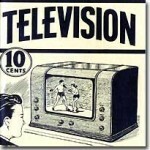 TELEVISION STANDARDS: In June 1941 the NTSC determines that television will be 525 lines, 60 fields, interlaced scanning. In December, 1941 Pearl Harbor involves us in the War and industry is converted to war materials. 3. POST-WAR AFFLUENCE: After the war ends in 1945, Johnny comes marching home, gets a good job, gets married, buys a home in the suburbs, buys a car and refrigerator, even a new radio or two. The babies that result will become a major population by the mid-50s. 4. TELEVISION ARRIVES: By the late 1940s, television catches on. 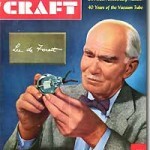 The years 1948 – 1952 are growth years for TV like the early 1920’s were for radio. Programming is mostly controlled by the same networks and sponsors as radio. Rural areas will not get TV until the decades end. 1. RADIO WITH PICTURES: All the big stars and programs and advertisers that made the 1930s and 1940s the “golden age of radio” defect to TV. 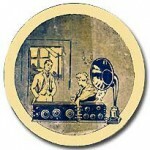 Radio must localize, play records. 2. MOVIES SUFFER: TV is such a novelty that people actually stay home from the movies. The movies fight back with gimmicks like cinemascope, 3-D, big spectacles. They forget the scripts. 3. ROCK AND ROLL EMERGES: By the mid-50s, white entertainers who imitated and emulated black R&B singers from the 1940s were starting to be heard in big cities like New York and Cleveland. 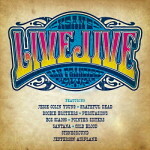 Elvis Presley and others were getting air play and selling records. Local radio is changed as some disc jockeys begin to sell records and mirror and influence the emerging youth culture, the baby boomers (born beginning in 1946) growing up into consumers. 4. RADIO IS ALMOST SAVED: By the end of the 50s, rock and roll artists are on TV. Imagine radio, being both on and ultimately being revived by the medium that almost killed it earlier. 5. FORMAT RADIO: Todd Storz, sitting in a restaurant in the mid 1950s, noticed how teens-to-be-soon-to-be-known-as-baby-boomers would always play the same songs over and over again on the jukebox. Why not make radio programming like that, short play lists, repeated. 6. RADIO NETWORKS EVOLVE: With all the entertainment programs going to television, and with most radio becoming disc-jockey-based, radio networks are left with only news. 7. SPOT RADIO: By the end of the decade, entire sponsor control of programming gives way to advertisers being able to buy a 30 or 60 second spot within a program. Now an advertiser could “participate” in the sponsorship of a program instead of owning it outright. Partly this change was hastened by the “blacklisting” of writers, announcers and musicians by advertisers who believed that some radio people had communist ties, wanted to overthrow the government. 1. TOP 40 AM DOMINATES: Probably based on the early work of programmers like MacClendon and Bill Drake, hundreds of AM stations embrace a “top-40 time and temperature” format. The saying, “be bright, be brief” was, it seemed, posted in every control room. Stations played three minute songs. The music was still controlled by cynical old white men. There were lots of jingles and promotions. Programming, music and contests are now targeted to a specific age group (12-35) based on demographic research showing this group has money to spend on good and services. The newly affluent middle class. 3. BEATLES: In 1963, just as the AM top 40 stations seemed to be sounding tired, a group of British acts arrived to influence the world music scene. Led by the Beatles and Stones, AM top-40 would rebound because of the new music. 4. UNDERGROUND AND PROTEST: The stage is about to be set for big changes. The audience would provide the catalyst for change. Suddenly there is much more music, much of it bold, most of it not controlled by traditional companies, much of it coming out of San Francisco and LA, much influenced by the 1968 Monterey Pop Festival. Campus war protests as the baby boomers hit college and fear the draft. Drugs and sexual experimentation. KSAN-FM. 5. FM MAKES A COMEBACK: For a system that was invented nearly 40 years earlier, it took a long time for FM to overtake AM. Pop music was better and it demanded a delivery service that sounded as good as a home audio system. AM stations still refused to play the new music from albums and were suddenly facing new competition from FM stations that would play the music. 1. 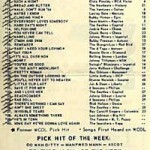 RADIO IS PREDICTABLE: AM Top 40 begins the decade with lock on the ratings. Even though it’s sound was stale, in some markets more than 50% of the people using radio are still tuned by habit to that “one big legendary AM station.” By the middle of the decade most of these major stations were struggling. AM stations even tried to meet the challenge by going “stereo” but no one cared. The big FM’s would rule by the decades end. 2. 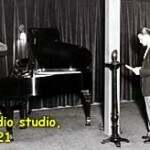 RADIO MAKES LOTS OF MONEY: The big music stations, once AM and now FM were making lots of money. There are plenty of listeners and times are good as far as jobs and money. Advertisers want to buy radio. There is even Disco on FM! 3. FORMATS FRAGMENT: There are no longer just two formats, top-40 on AM and progressive rock” on FM; now there are soft hits, old rock, new rock, classic rock, disco, young soul, old soul, Latino, etc. Each station has only a small segment of the audience. 4. RADIO NETWORKS RETURN: With inexpensive satellite technology available to every station, hundreds of new radio networks emerge and die, mostly offering music formats delivered by big city DJ’s. Smaller stations automate with them but it makes the station less local-sounding, less-appealing to listeners and sponsors. 1. DE-REGULATION: The Reagan administration de-regulates the industry. Stations now have to satisfy the demands of the marketplace instead of the demands of Federal regulation. Freely Translated: if it doesn’t make immediate money for your station, don’t do it. News and public affairs suffered. If you were a news writer, reporter and reader as every station had to employ in the 1970’s, now your station was no longer required to have news. 2. BUY-SELL BUY-SELL: Like the house you bought for a high price in the late 1980’s, the radio station you also bought is worth less than you paid. This means cutbacks, more automation, less news and public affairs types. In the 1980s almost half of the radio stations changed hands. 3. NEW OWNERS, NEW CHALLENGES: For young people seeking a career in radio the good news was if you are good at sales, promotion or production of promotions, you’ll work. 4. A SMALLER PIE: The number of stations swelled to 12,000 and in major and large markets, there were perhaps 100 to 200 stations vying for listeners. The era of Niche Programming and formats begins and now there is a format for every narrow interest. Again, less people have to do more. To succeed you have to be above average, tenacious, persistent. 5. AM TRIES A COMEBACK: Helped with new technical regulations, promises of fewer stations and an expanded AM band, the FCC and station owners try to save AM one more time. 1. AUTOMATION SAVES THE DAY: Less people do more work. New radio station owners want to cut costs, use automation to run three stations at once. One office, engineering, announcing staff, three stations at once. No union problems because the unions in radio are practically irrelevant. 2. NEW GROUP OWNERS & DUOPOLIES: One company can now own 25-25-25 plus and in San Jose and San Francisco some companies own many stations. In this market most of each day is automated. 3. DIGITAL TAKES OVER RADIO TECHNOLOGY: Now an entire day can be stored, edited and broadcast using the hard drive of a computer. Production that used to involve splicing tape is now done with the click of a mouse. Analog devices like cart machines will disappear by 2004, to be replaced with computer memory. 4. NEW DELIVERY SERVICES: Digital stuff, Internet, etc; all future non-FM delivery services. Still, AM is around after almost 100 years. And just like the transition to television, current owners want to be first in line when licenses are issued for these new services. 5. TALK RADIO’S DECADE: Rush, Conservative politics, and suddenly many struggling AMs are revived and saved again by talk radio. 1. 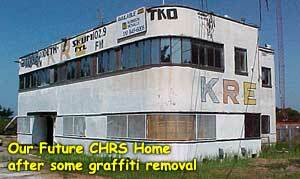 CHRS saves the building of local AM classic KRE: In the 1973 film, American Graffiti, legendary DJ Wolfman Jack is seen on the air in a radio studio, also seen answering the door of an art deco-looking building. 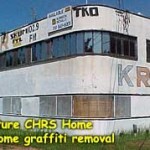 That is KRE in Berkeley, once covered with modern-day graffiti. 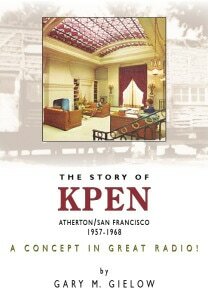 Our Society has restored this historical piece of California radio history. It will be our headquarters until it is sold and we are shown the door. 1. Stay tuned to radio on your iPad, iPhone, maybe you even have a real radio! See us if you want one. 2. So where is radio in your foreseeable future? Probably still in your hand, your phone.